While practicing in an empty section of Central Park, the TMNT are ambushed by the Shredder. Well, not quite; it turns out to be Mike in disguise. Before they can clobber him, a spaceship crashes into a nearby lake (this stuff happens all the time). They rescue the alien pilot from the bottom of the lake, but he’s dying from his injuries. Before he croaks, he tells them to find the three fragments of the Eye of Sarnath, a mystical jewel that can grant the possessor undreamed of power. He then gives them a device which will locate the pieces before he disintegrates. As the Turtles head out to go fragment-hunting, they fail notice the Shredder, who heard the whole thing while hiding beneath a bush (so dignified). As the Turtles make haste in the Turtle Van, Shredder reunites with Baxter Stockman and sends his findings back to Krang. Krang still refuses to send him any Foot Soldiers and Shredder concedes to gather the Eye of Sarnath on his own. 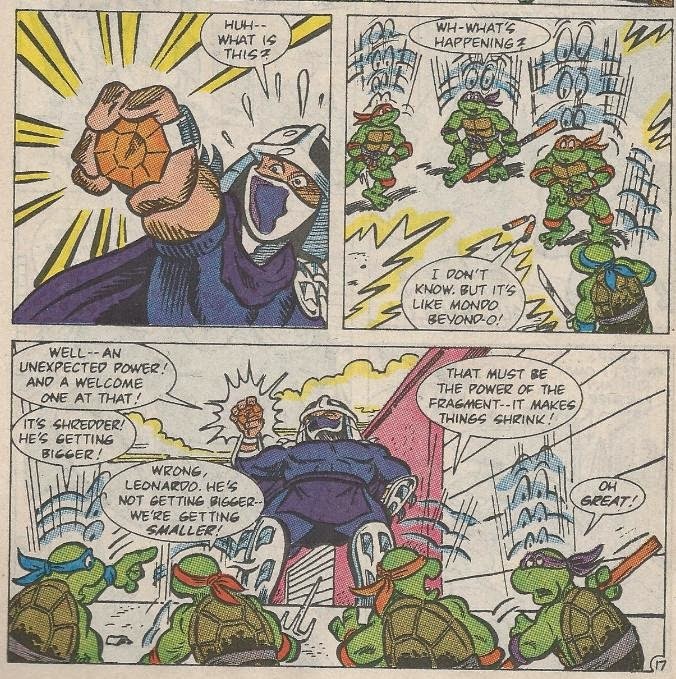 The Turtles track the first fragment to a garbage barge and dig it out, only to have it snatched from their hands by Shredder. Shredder easily defeats them in hand-to-hand combat and then uses the power of the fragment to shrink them all to action figure-size. The Tiny Turtles manage to escape into the sewers with their (now relatively humongous) tracking device and are recovered by Splinter. Splinter then sends for help from April via the Turtle Communicator. At Channel 6, April is being yelled at in a meeting by Burne. April cuts out of the meeting and goes to see Splinter. Meanwhile, Shredder once again contacts Krang, but this time with news of his victory. Krang refuses to believe him and tells him to come back with proof. 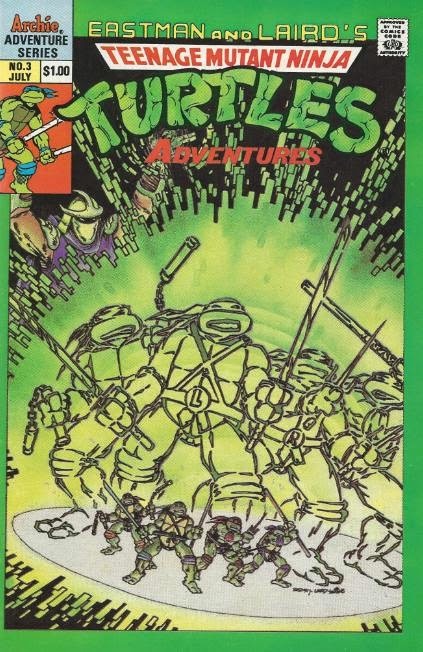 *This story is adapted from the episode “The Incredible Shrinking Turtles” from the Fred Wolf TMNT cartoon. *The back of Mike’s fake Shredder helmet features the words “Ninja Pizza”. 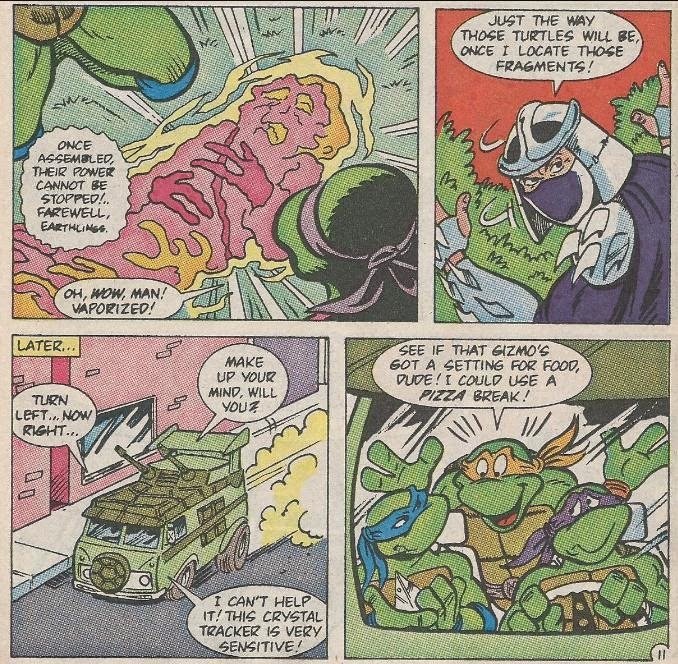 The TMNT visited a restaurant called Ninja Pizza in TMNT Adventures (miniseries) #1. *Sarnath-himself will appear in TMNT Adventures #46 and we'll find out the true nature of the eyes and the alien pilot in TMNT Adventures #47. *This issue was reprinted in the UK by Fleetway as TMHT Adventures #6. Only one more adaptation issue to go after this one! You can make it, folks! I believe in you! “The Incredible Shrinking Turtles” seems to make the transition to the printed page far better than “Return of the Shredder”, I must say. It might have something to do with the new creative team of Beth and Ken Mitchroney. They adapt the script much more smoothly, giving the right amount of screen time to the Turtles and their supporting cast per issue. Likewise, Ken Mitchroney’s art suits this book far better than Garcia’s and, dare I say, even Dooney’s! It’s very expressive in an overtly cartoonish sort of way and really works. It’s much less bland than Garcia’s efforts and a bit more whimsically fun to look at than Dooney’s contributions. Mitchroney seems to have set the tone for many future artists on the book, as even perennial favorite Chris Allen will more or less take a cue from his style. Mitchenroy will be hanging around for a good while, too, so we have that to look forward to. 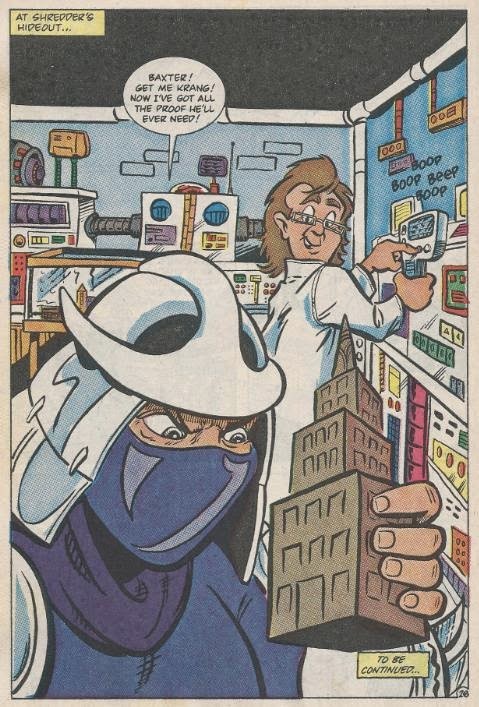 One thing I actually appreciate about this adaptation is that we actually get to see how Shredder gains possession of the Empire State Building after shrinking it down. In the cartoon, the show cuts abruptly from the shrinking to Shredder's hideout. Whereas in the comic, we get to see Baxter in police gear lying about his intentions and then swiping the building. It's not much but it does help this wacky story make a little bit more sense. Man, I had this story in VHS and the picture book format, but not in comic form. Yay corporate synergy/money-grab!